What does it mean to be deaf? Evelyn Glennie, a world-famous percussionist (with severe hearing loss) once stated, “If we see someone in a wheelchair, we assume they cannot walk. It may be that they can walk three, four, or five steps. That, to them, means they can walk.” According to a study completed in 2003 by the Hearing Loss Association of North Carolina, only 3% of the U.S. hard-of-hearing population is completely deaf; most individuals can hear partial sounds. Deafness is defined as partially or wholly lacking the sense of hearing. The World Health Organization (WHO) estimates that there are more than 360 million people worldwide who suffer from some degree of hearing loss. Deafness can be caused by multiple circumstances including constant exposure to loud noises, a traumatic injury, or a genetic condition. FUN FACT: There are several artistic production companies dedicated to performances by or for people with hearing loss including the National Theater of the Deaf and the National Deaf Dance Theater. 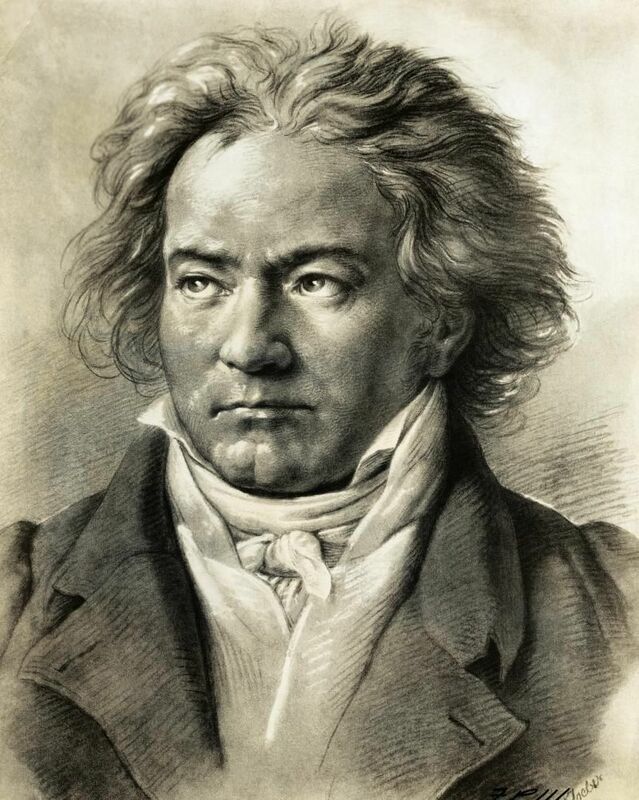 Born in 1770, Beethoven was a German composer and pianist who fell right in between the Classical and Romantic eras. He is best remembered for his contributions to “illustrative music” and for becoming the first successful musician without additional servant’s duties (Britannica). Due to unknown circumstances in his thirties, Beethoven’s hearing quickly began to wane, leaving him completely deaf for the final decade of his life. The composer famously continued to both compose and conduct, stating, “The barriers are not erected which can say to aspiring talents and industry, ‘Thus far and no farther.’” His most successful works include Ode to Joy (1824), Symphony No. 9 in D Minor (1824), Eroica Symphony (1805), and Moonlight Sonata (1801). Brande Plotnick from Healthy Hearing describes modern hearing aids as “tiny technological marvels” that come in a wide variety of styles and sizes. When selecting a hearing aid, individuals must first decide whether the In-the-Ear (ITE) or Behind-the-Ear (BTE) models are the best fit. Contemporary hearing aids often include both wireless and Bluetooth technologies to allow the user additional freedom and control. According to the American Speech-Language-Hearing Association (ASHA), Personal Frequency Modulation (FM) Systems “are like miniature radio stations” that connect a wireless microphone (for the teacher) directly to the student’s hearing aid or headphones. This revolutionary tool can be used in multiple situations including lectures, religious services, and business meetings. Students who are hearing impaired may need a slightly altered lesson when it comes to rhythm or pitch. These traditionally auditory lessons can be adapted to include visuals like flashing lights, hand signals, or by allowing the student to feel the vibrations from a large speaker or drum. If speakers are not sufficient for the student, specific pitches can be adjusted using an electronic tuner. Most important, is the director's ability to communicate with the student and assess their progress. The National Deaf Children’s Society (UK) reminds educators to consider how a hearing aid or cochlear implant might interpret sounds differently since traditionally, hearing devices are designed to help the individual interpret speech and not music. When explaining a new concept to a student who is hearing impaired, music educators must be patient, keep steady eye contact, and employ animated facial expressions. When staging the classroom, students with hearing loss should be placed close to the front of the room. In the rare case that a student is completely deaf, educators should remember to face the student (for lip-reading purposes) or provide a printed copy of the lesson. Directors can provide additional relief to students with hearing loss by removing excess noise from the classroom (ex: loud air conditioning units, buzzing televisions, rattling speakers, etc.). It is important that students who are hearing impaired are able to focus on the director’s voice and the musical sounds being produced. Learn more at the American School For the Deaf or the National Association of the Deaf. Britannica. Encyclopaedia Britannica, Incorporated. 24 April 2017. Web. 13 August, 2017. Networks. 27 April, 2017. Web. 13 August, 2017. “FM Systems.” American Speech-Language-Hearing Association. 2017. Web. 13 August, 2017. "Deafness". Dictionary.com Unabridged. Random House, Inc. 13 Aug. 2017. Deaf Children’s Society. Inclusive Activities team, Information and Resources Library. N.d.